This enclosure was very much in fashion in the first half of the twentieth century, and many variations were worked out for it. 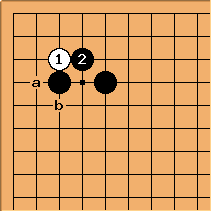 For a while the tight style characteristic of early komi go led to the small low shimari being the predominant choice; but this enclosure is an integral part of contemporary go. It in fact may be considered more complex than the small low shimari; it aims more at influence and the way to play with it is more related to the 4-4 point. 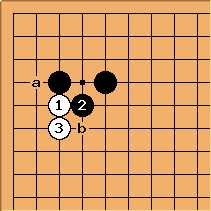 Compared to the 4-4 point it is clearly slower; but a double-wing formation based on it is more formidable than such a formation involving a 4-4 point in the corner (because there is no corner invasion as simple as the 3-3 invasion) and harder to reduce than such a formation based on the small low shimari. See double wing formations based on small high enclosure. Enclosure opening - high variant. This enclosure is important in the Chinese fuseki. See plays against low Chinese - follow-ups for a study of possibilities later in the game. There is a complex set of techniques concerned with invasion, reduction and probe plays near this enclosure. Unfortunately the treatment in Enclosure Josekis (out of print) isn't very reliable in its choice of main variations. 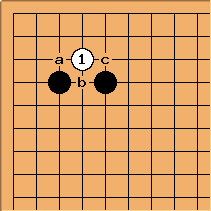 There is a Go Super Series book by Okubo Ichigen called Shimari Joseki which gives many hundreds of diagrams; but it too lacks authority in parts. Therefore, although there is much material scattered through the literature, it seems that really reliable information must come from database research. BobMcGuigan: The book Keshi and Uchikomi - Reduction and Invasion in Go by Iwamoto has a lot of information related to the one-space high shimari. One important technique is here. White will find it quite easy to handle her group; but Black can probably build good influence on the top side. Next Black at a is orthodox, but Black at b can also be playable. here is the simplest way to handle the corner. is the standard shape, but if Black is quite strong locally other answers can be considered. Next White at a is a small-scale move, while White at b can be useful in fighting taking the whole left side into account. is a sharp way to play, often leading to a serious ko fight. Black has standard answers at a, b and c, all of which can lead to difficult variations. Black a may seem passive, but may indicate that Black intends to kill White (as in a famous game Fujisawa Hideyuki-Kato Masao). Amateur players are probably too fond of this technique, and over-use it compared to the other two above.